If you've ever had a serious mouse problem, you know how difficult it can be to get rid of more than a mouse or two. Sometimes, when other options, like traps, have failed, you need chemicals to deal with your mouse problem. 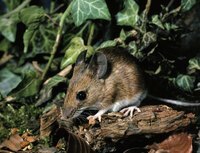 Called rodenticides, chemicals, or pesticides, that have been specifically designed to kill mice come in a variety of forms and can be dangerous to mice, humans and pets alike. Used to poison large rat or mice populations in industrial buildings, anticoagulants kill by interfering with the blood-clotting process, which causes bleeding and internal hemorrhage. Anticoagulants come in two types: first-generation and second-generation. First-generation chemicals, like Warfarin and D-CON, are retained in a mouse's body for only a few days and require a high dose to kill. Second-generation anticoagulants, including brodifacoum and bromadiolone, are toxic even in low doses and can stay in the body for weeks. Typically green or blue in color, anticoagulants come in blocks, pellets, packs or powders and can be extremely harmful to pets and humans, even to the touch. Found in many rat or mouse pellet baits or blocks, bromethalin keeps the mouse's body from using oxygen for energy. Used in high and low doses to kill mice, bromethaliin is toxic to pets, too. If ingested by a pet, bromethalin can cause vomiting, tremors, seizure or coma. According to the New England Animal Medical Center, cats are more susceptible to bromethalin poisoning than dogs. Extremely toxic, cholecalciferol is often mixed in with seeds or grains to prevent mouse infestation. Cholecalciferol increases the level of calcium in the blood to dangerous levels, eventually leading to heart problems, soft tissue issues and death. Bare skin contact with the chemical can be harmful to humans and pets. If ingested, less than one pack can kill a small dog. Ortho Mouse-B-Gone, Rampage and Rat-Be-Gone are brands in which cholecalciferol can be found.